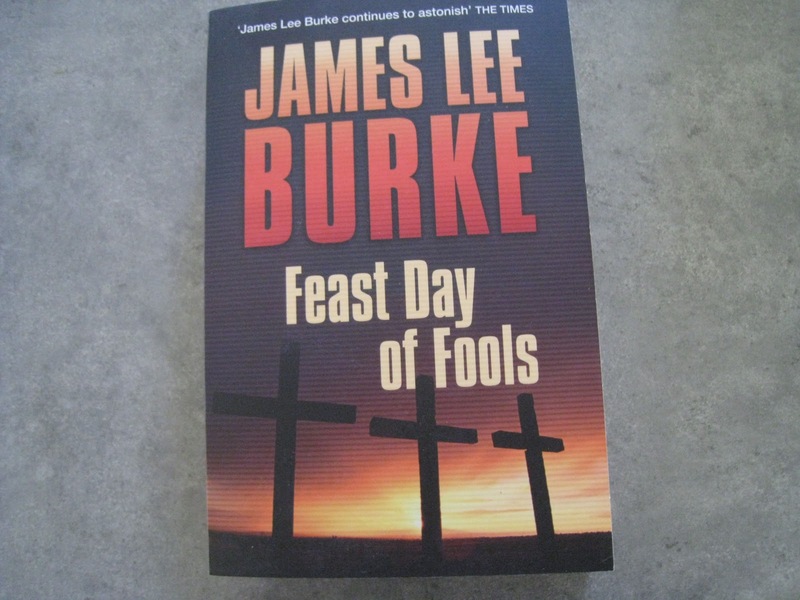 The Little House of Concrete Bookshelves: James Lee Burke "Feast Day of Fools"
Here's a perfect example of Hughesy's need to write something down to remind himself of what he's read. 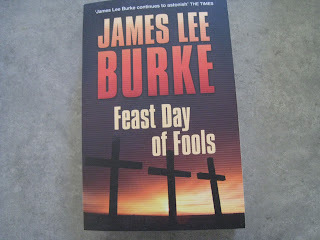 Feast Day of Fools is the third title inJames Lee Burke's Hackberry Holland series, and while I have a copy of 1971's Lay Down My Sword And Shield on the shelves, there's no sign of 2009's Rain Gods in the same area, though I have vague memories of reading a Burke title from the Gold Coast Library at some stage over the past couple of years. Then again, there's quite possibly a copy sitting in a pile of books over at The Actor's place, but whatever version of reality applies here there's something missing in the sequence as far as Hughesy's memory is concerned, and where a James Lee Burke series is concerned those memory factors are a key ingredient in the enjoyment of the reading process. While it's not totally necessary to read these books in sequence, and latecomers to the eighteen-title Dave Robicheaux series are going to have difficulty in that regard, there's always a degree of carry over from one title to the next and while each title stands comfortably on its own there are nuances in there that only really come out if you've read the preceding title. That applies a little more than it usually does in this case. We first encountered Hackberry Holland, cousin of Texas attorney Billy Bob Holland (Cimarron Rose, Heartwood, Bitterroot, In the Moon of Red Ponies) as far back as the 1970s in Lay Down My Sword and Shield, though there's a fair time lapse between that story of a Texan attorney and Korean War POW being pushed by his wife, his brother, and friends in the oil business to run for Congress and becomes caught up in a civil rights conflict and the later volumes. In the intervening period since the early days of the United Farm Workers he's been a civil rights lawyer and ended up after the death of his wife as the local sheriff in a small community on the border between Texas and Mexico. Rain Gods takes place in that setting with the machine-gunned bodies of nine young Thai women found in a shallow grave behind a church, an Iraq veteran and his girlfriend running for their lives, a serial killer known as Preacher Jack Collins, the FBI, Immigration and Customs Enforcement, and assorted cold-blooded killers running along intersecting plot lines (in these cases Google is your friend) as Sheriff Holland and his deputy Pam Tibbs try to figure things out. References to those nine Thai women and your actual Preacher Jack turn up again in Feast Day of Fools, and while you don't actually need to know the back story from last time around it'd definitely help when it comes to elucidating the tricky and apparently long-standing interaction between Hack Holland and the bible-toting and quoting serial killer. The action starts when Native American alcoholic semi-vagrant Danny Boy Lorca witnesses a man tortured to death in the desert, reports it to the authorities and the investigation leads more or less directly to the door of La Magdalena, Anton Ling, a mysterious Chinese woman known to assist illegal immigrants crossing the border. While she claims to know nothing about the case, the dead man's companion, a government agent the killer had planned to sell to Al Qaeda, had sheltered there, and has now found his way into the company of serial murderer Preacher Jack. The killer, a former mercenary named Krill is haunted by the unbaptised deaths of his children, also turns up on her doorstep, as does his illiterate and psychopathic offsider Negrito and the Reverend Cody Daniels, an ex-convict who's looking for salvation and/or revenge (seemingly it's a case of whichever comes first). Holland repeatedly turns up on the doorstep as well, apparently spellbound by La Magdalena's resemblance to his late wife, much to the dismay of Deputy Pam Tibbs who has her own interpersonal aspirations as far as Hack is concerned. Psychopaths, illegal immigrants, drug smugglers and gun runners, Russian mobsters, corrupt employees of the federal government, figures from Hack’s distant past and immigrant-hating rednecks roam across the desolate landscape, and there are enough conflicts of interest to bring the strangest combinations into an uneasy alliance against mutual enemies before an enigmatic ending that sets things up for a sequel. Burke is a master craftsman whose prose shimmers and deserves to be savoured, a story teller who gets better each new time around and Feast Day of Fools is right up there with his very best efforts. Which, of course, from where I'm sitting ranks it right up there with the very best there is.